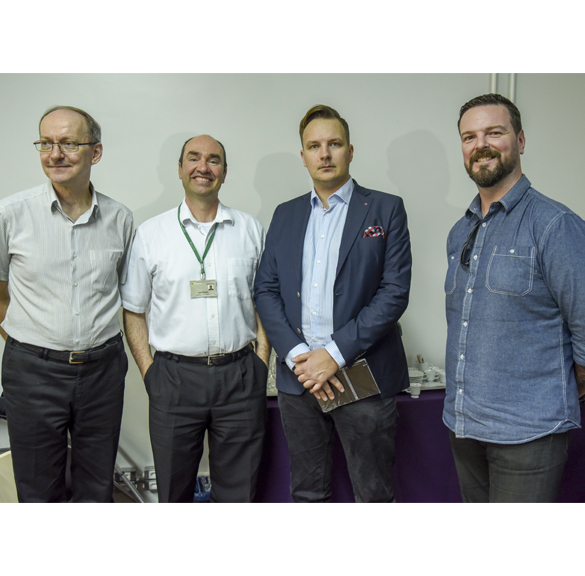 Finnish University officials have visited the institution to talk to researchers. Feevale University received representatives from the University of Applied Sciences (Hamk), Finland. Welcomed by the Board of International and Institutional Affairs, the director of the Smarth Services research center Vesa Salminen and the solutions and digital research manager Joni Kukkamäki had a meeting with the coordinator of the Masters in Creative Industry of the Institution. Susan Schreiber, and together with Professor André Conti to discuss a possible partnership between intitutions in the area of the Creative Industry. In addition, the Finns took part in meetings with Feevale´s researchers this week. For Schreiber, in the conversation with representatives of the Finnish University, it was possible to perceive the points of convergence which allows common research. ‘I see it as a very important meeting to start an international cooperation between institutions, with the aim of strengthening the ties in research, specifically in the Creative Industry, by bringing together interests between both Universities’ he said. ‘Including the topic of the Creative Industry it was very good, as discussions showed both Universitites are doing the same acitvities and we can benefit and share our experiences in practices’, explained Kukkamäki. The importance of attending the International Strategic Seminar - Beyond the Alliance for Knowledge (BAK), held in Finland on 24th and 26th, and countting on Feevale's rector, Cleber Prodanov, attendance, as well as from the International and Institutional Affairs Board, Paula Casari Cundari, and the researcher Fernando Spilki. ‘Topics discussed last week have brought us closer together and were very important to an organized agenda with each research group in order to achieve the goals of the two days meeting’, he said. Hamk's representatives discussed the issue of seven topics with Feevale's reserachers.